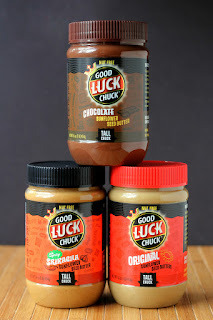 A while back, I posted an ice cream recipe made from a chocolate and sunflower seed butter that I got from a local company called Good Luck Chuck. While I was pretty fond of that recipe, I have to say that the very first recipe I thought of was a savory one. When I heard there was a sriracha-flavored sunflower seed butter, my first thought was about the peanut dipping sauce for chicken sate. But I envisioned it as a spicy chicken gravy, sort of. Well, first I was thinking that I didn't want to thread chicken onto skewers, and a spicy nutty sauce would be good as a sauce for chicken thighs. With those thoughts in mind, I went into the kitchen and started fiddling around with flavors. The first thing I knew I wanted to do was to make this recipe in my slow cooker. It's warm out (and inside) and the slow cooker doesn't heat up the kitchen. And I don't have to watch it all that carefully. If your slow cooker has a browning setting, heat the olive oil in the slow cooker, then brown the chicken, skin-side down, then flip it over and brown it on the other side. If your slow cooker doesn't have a browning setting, you can brown the chicken in a skillet, then add it to the slow cooker. You can also skip the browning, but it adds extra flavor to the chicken and helps the texture of the chicken skin. Add all of the other ingredients, and stir to combine. 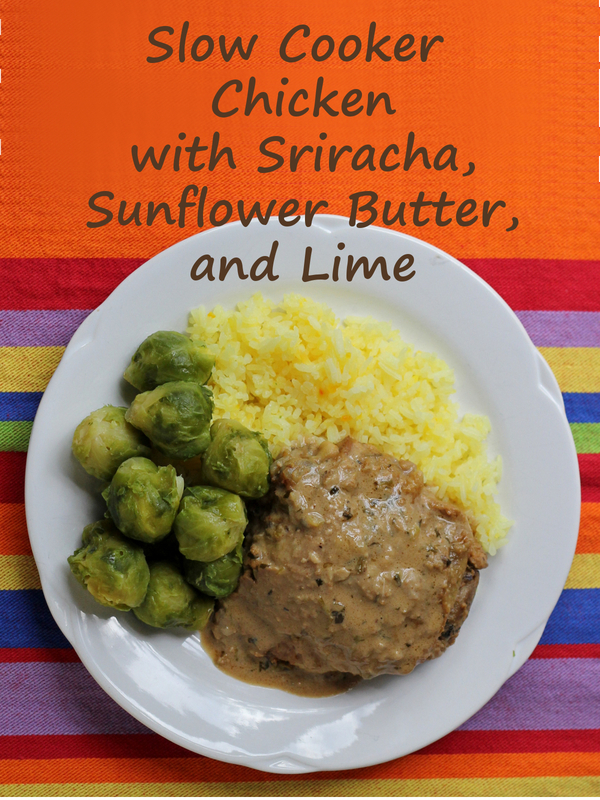 Cover the slow cooker and cook on low for 4 hours, or until the chicken is tender. Check the chicken a few times to make sure there's enough liquid in the cooker - you want a sauce consistency, so add water, if needed, during the cooking process. Depending on your cooker, you might not need to add more. Taste for seasoning and add more salt, pepper, or lime juice, if desired. Serve hot, with the sauce. To take advantage of all of the tasty sauce, consider serving this with rice. Good Luck Chuck is currently for sale in a limited geographic area, but if you're not in the neighborhood, you can also buy it on Amazon. Thanks to Good Luck Chuck for sponsoring these posts! When I was a kid, my mom made a salad that was incredibly simple: it was nothing but sliced tomatoes, salt, black pepper, white vinegar, and white sugar. It almost sounds too simple, right? The fanciest ingredient was the farm-fresh or home-grown tomatoes. Because of course this was only made in summer when tomatoes were in season. But fresh summer tomatoes don't need a whole lot to make them wonderful. With that salad, every single ingredient served to enhance the tomato flavor. I usually make this salad at least once over the summer, sometimes making it more sweet, and other times edging towards the puckery-tart. But this time, I decided to change things up a bit. Instead of using sugar, I decided to use honey. And not just any honey - I used clover honey creme from Honey Ridge Farms. I got the honey through 37 Cooks (and by the way, this recipe will also be published on the 37 Cooks blog), and I really wanted to find a way to use the honey in its purest form not cooked into something. Short of eating it with a spoon (which I might or might not have done - it's really good!) I was stumped. Well, I could have drizzled it on ice cream or English muffins. Despite those being delicious ideas, they wouldn't have been a very good recipe. 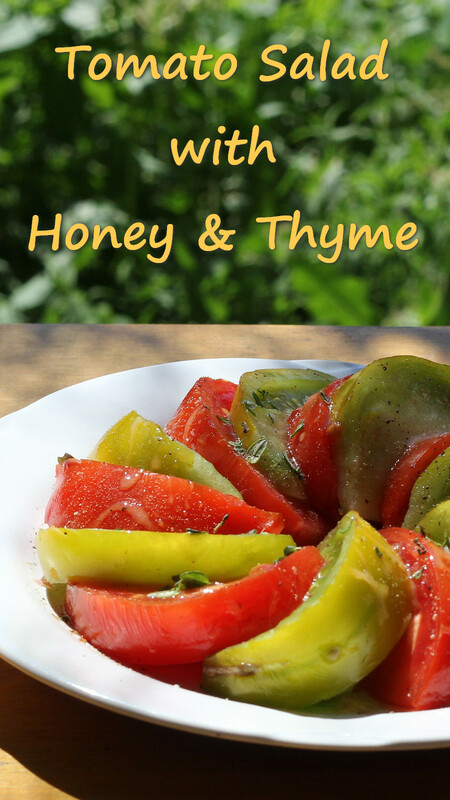 But when I brought tomatoes home from the farmer's market, I had the idea of using the honey with the tomatoes. And of course you could use just one large tomato. Or use several tomatoes to make a whole platter for a party. 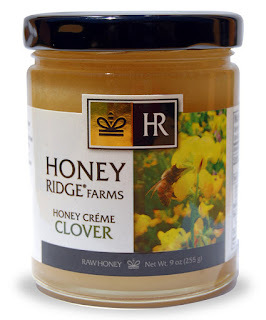 I also received a bottle of Honey Balsamic Vinegar from Honey Ridge Farms which was outstanding. 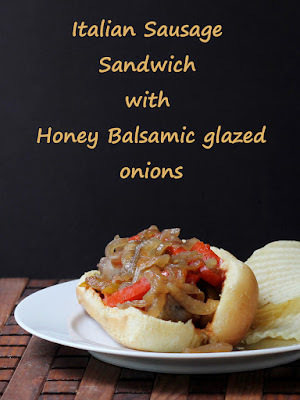 Check out my recipe for honey balsamic glazed onions that I used on Italian sausage sandwiches. Looks normal, but the flavor will surprise your guests. This might be one of the simplest recipes I've posted on this blog, but it's really, really, really good. The funny thing is that after all the cauliflower that I've cooked over so many years, this is something I never thought of doing until I saw it in a cookbook. The book is It's All Greek to Me. 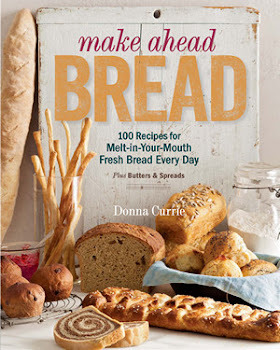 It's another book from the round-robin cookbook group, Cook My Book. While there were more complicated recipes in the book, I like this one because of the "aha" moment it provided. If I never thought of cooking cauliflower like this, maybe you never did either. And it's so simple, you could do it any time you're in the mood. If the florets have any browned spots, cut them off and make sure all the florets are about the same size for even cooking. Cook the cauliflower in salted boiling water until crisp-tender (or cook a little longer, if you prefer). Drain the cauliflower and immediately drizzle on the lemon juice and olive oil and toss to combine - while it's hot it will absorb the flavors. Taste for seasoning. Grind on some black pepper and add salt, if needed. Add extra lemon juice and/or olive oil, if desired. I adore artichokes. I like them stuffed, and plain and I like the hearts in recipes or pickled or in salads. In this case the artichoke hearts are totally the star of the show. The lemon juice adds brightness, the olive oil adds richness, and the Italian seasoning adds .... well, seasoning. This isn't as tart or as oily as marinated artichoke hearts, but it's got some of the same flavors. If you prefer a more tart, pickled flavor, add more lemon until it suits your taste. You can use this on its own as a pre-dinner nibble, a side dish, or on a salad. Or, if you're me, a snack. Melissa's Produce sent me several of their seasonings along with a cookbook that I'll be reviewing later. I wasn't required to write about the seasonings or other items they sent. The seasonings come in grinder containers and include salt along with herbs and spices. I thought the Italian one would be a good choice with these artichokes. If you don't have exactly this seasoning, use your favorite Italian blend along with some salt. No seasoning blend? I've made similar salads with just dried oregano. Heat the olive oil in a saute pan. Add the artichoke hearts, bell pepper, and seasoning. Cook, stirring or flipping as needed, until the peppers are cooked but still crisp and the artichokes are browned in spots. Add the lemon juice and stir. Cook for a few seconds more then remove it from the heat. This can be served hot, warm, or cold. If you like, you can drizzle it with more olive oil and lemon juice before serving. The original daiquiri cocktail was nothing more than rum, a little sugar, and lime juice. That's it. But cocktails evolve, and people fiddle. I certainly like to fiddle with drinks. It's fun and it's usually tasty. 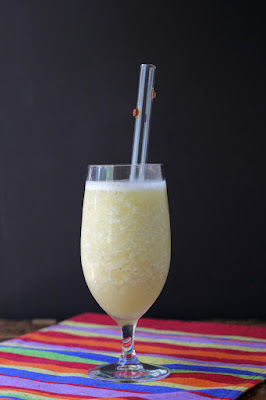 This banana daiquiri can be made with or without the rum - it tastes really good as a mocktail. 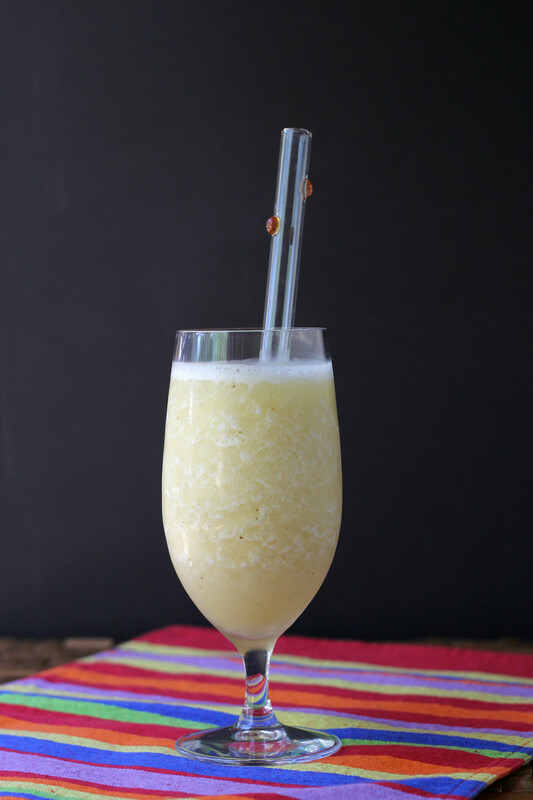 Despite the banana, it doesn't taste like a smoothie - it's light and refreshing and fruity and thirst-quenching. The key to getting the ice pulverized is to blend it first - without the banana or other ingredients. Depending on your blender, you might have more or less success getting the ice completely blitzed into snow, but for sure you'll have better success if you don't add anything until the ice is as small as you can get it. If you make a lot of cocktails - or even a lot of ice tea or lemonade - making your own simple syrup is incredibly easy. Just combine equal volumes of sugar and water, bring it to a simmer - you can do this in a saucepan on the stove, or a microwave-safe container in the microwave. Stir as needed until the sugar has melted. Let the simple syrup cool, then transfer to a bottle or jar. Blitz 1-2 cups of ice in your blender until you have a fine "snow." Add the banana and blend until smooth. Add the lime juice and simple syrup and blend until combined. A plain white or light rum works well, but I've also made this with Captain Morgan Pineapple rum and Captain Morgan Grapefruit rum. They add a little extra flavor without overwhelming the banana. If you want a mocktail, it's simple - just don't add the rum. It's a lovely fruity drink for anyone. 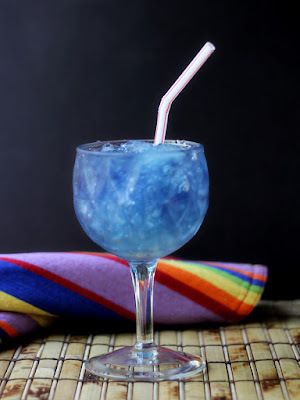 If the mocktail is for an adult who wants the flavor of the rum without the alcohol, you can add 1/8 teaspoon (or less) of rum flavoring - the stuff that's typically used for cakes and candies. I love Italian sausage, if it's the right kind. As an ex-Chicagoan, I want fennel seeds in my "sweet" Italian sausage. It's not really sweet, like sugar, but the sweet designation lets you know that it's not hot sausage. Which is fine for some things. But not for my sausage sandwiches, or on pizza. And, if you're from Chicago, you know at least one person who pronounces sausage as sah-sidge. If they're really hard-core, you might even hear about the ever-so-popular sah-sidge sangwidge. 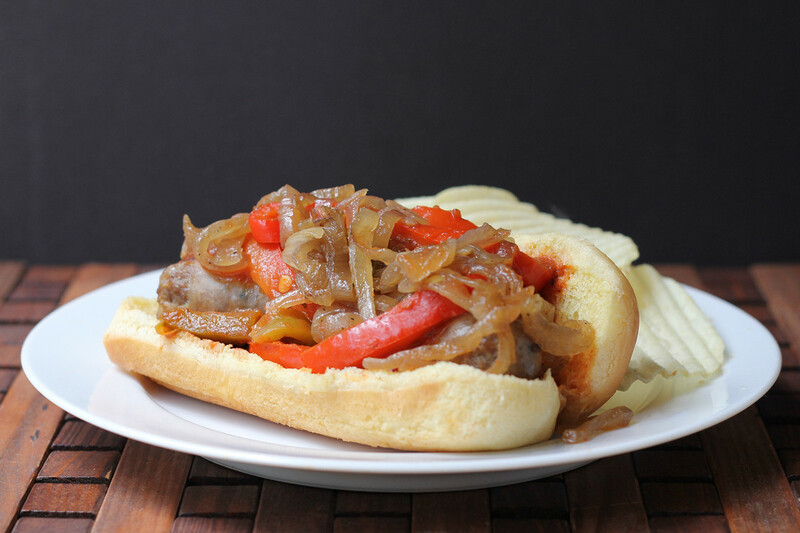 This isn't the traditional Italian sausage sandwich, though. Oh, it's got the traditional peppers and tomato sauce. But the secret ingredient this time is the honey balsamic glazed onions. 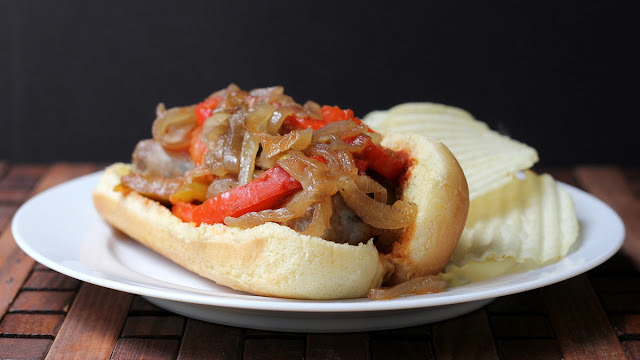 They add a sweet-tart flavor that really complements the sausage and peppers. The onions cook down a lot, and they might just become your new favorite condiment, so consider making extras for burgers, hot dogs, pizza, and panini sandwiches. I had to stop myself from "sampling" the onions until they disappeared. They're insanely good. The vinegar came from Honey Ridge Farms, courtesy of the blog group 37 Cooks, where we cook up challenge recipes using fun ingredients. 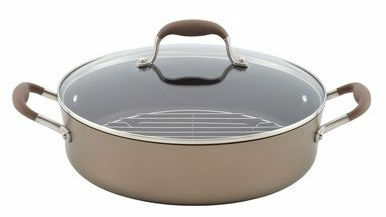 Heat the olive oil in a medium saute pan. Add the onions, salt, and pepper. Cook on medium, stirring as needed, until the onions begin to soften. If they start browning, turn the heat down. Heat the olive oil in a medium saute pan on medium heat. Add the peppers, oregano, and salt, and pepper. Cook for a minute or two, then add the wine. Let it come to a simmer, then add the tomato sauce. Quite some time ago, when my husband and I went on a Caribbean cruise, we enjoyed plenty of sun, sea, and rummy tropical drinks. Rum wasn't in just the drinks, though. Rum raisin ice cream was on the dessert menu and the pool menu and the snack menu and probably the room service menu, too. Which was ... not great. I love rum and dislike raisins. But that's okay. Now I make my own rum ice cream, without raisins. If I was tempted to add something else to the ice cream to make up for the lack of dessicated grapes, I'd add probably add walnuts. But I actually like it just like it is. 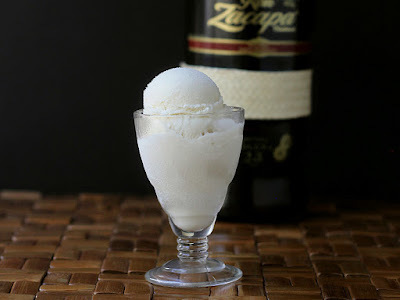 The Ron Zacapa 23 Rum that I used is a deep-flavored rum, so it adds lovely caramelly flavor to the ice cream. But if you don't have that brand, I suggest using a dark rum rather that a light one. Light rums are great for fruity cocktails and citrusy punches, but they wouldn't have the same impact as the dark rum in this ice cream. Okay, if you have to, a golden rum would work, too. Just until you have a chance to run to the store for that bottle of dark rum you know you want, anyway. I also added just a little bit of Butter Rum flavoring, to add buttery notes and even more rumminess to the ice cream. If you remember butter rum candies - the less-common cousin of butterscotch candies - that's the flavor that the Butter Rum flavoring adds. If you don't have Butter Rum flavoring, don't worry. The rum adds plenty of flavor on its own. Combine the sugar, salt, and cornstarch in a heavy-bottomed saucepan. Whisk. Add the cream and milk. Whisk to combine. Make sure there are no lumps of cornstarch before you turn on the heat. Heat on medium, stirring until the sugar dissolves. Continue cooking, stirring often, until the mixture comes to a frisky simmer and it thickens. It tends to froth and boil up in the pan, so watch it as it reaches a boil. When it has thickened, turn off the heat and stir in the rum and the butter rum flavoring. Transfer to a storage container and refrigerate until fully chilled. I usually let it chill overnight. When the mixture is fully chilled, churn in your ice cream maker according to the manufacturer's instructions, then transfer to a storage container and freeze until firm. I absolutely love pasta salad. I like it as a side dish or a meal. Heck, I've been known to eat leftover hot pasta in its chilled state. This pasta started with some purple asparagus, and then I started adding colors ... um, I mean vegetables ... to the concept. The mini zucchini I bought were seriously mini - the diameter was about the size of a dime. If you use the larger (but not giant) zucchini, you can quarter them lengthwise first, then slice, if you prefer. Or just slice them into larger rounds. This salad has a nice balance of textures, from the soft tomato, to the pasta, to the crisp zucchini. The olives are optional, and you could certainly use a different type of olive. I tend to fling olives into salads without thinking, so this time I purposely left them out. For a while. Well, okay, when the salad was about half-gone, I might have tossed in a few extra olives. Hey, the jar was nearly empty, and I needed the space for a fresh jar of olives. Speaking of asparagus, there was a short time when I was absolutely terrified of it. My mother never cooked it, so I was unfamiliar with it. But a friend's mom would occasionally invite me over for "spare-grass and eggs." No, I didn't mis-hear. That's what she said. Given that my mom would forage dandelions in the spring, I had visions of this woman serving lawn clippings in scrambled eggs. I just couldn't do it. Then one fateful evening, I went out to dinner at a relatively fancy place and the vegetable that came with my entree was white asparagus with hollandaise sauce. I have no recollection of the entree, but I was enthralled with the asparagus. I could have eaten a whole bushel of it, if they had served it to me. I was in love. No more spare-grass fear. The purple asparagus in this recipe came from my good friends at Frieda's Specialty Produce, who send me all sorts of fun things to work with. The purple asparagus should be cooked quickly so it doesn't lose its color. If you cook it too long, it turns green. Which isn't a terrible thing. It's just not purple any more. As usual, I cooked the asparagus to be served warm for dinner, and refrigerated the rest. I love cooked, chilled asparagus, sometimes drizzled with just a little bit of balsamic vinegar. This time, though, I was yearning for a little pasta salad. Add the lemon juice and olive oil to the pasta as soon as it's done cooking, so it absorbs the flavors. Once the pasta has cooled to room temperature, add the remaining ingredients, and stir to combine. Taste for seasoning and add more salt, pepper, or lemon juice, as desired. If you're using the kalamata olives, you can add some of the brine rather than adding salt - it gives a little extra flavor along with the saltiness. 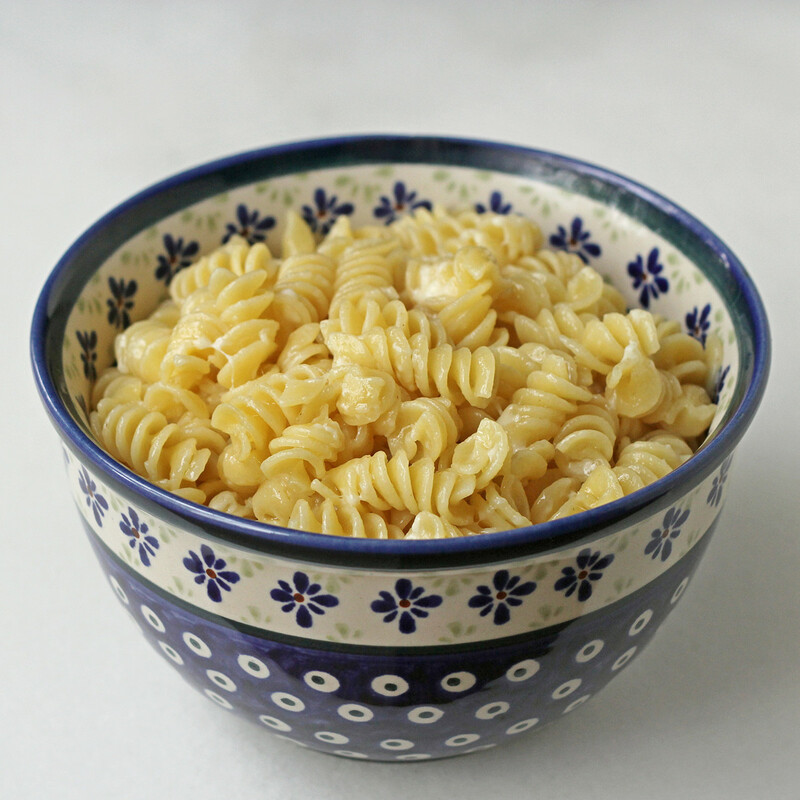 If the pasta salad seems a bit dry, drizzle on a little extra olive oil before serving. Have you ever tried cooking pasta by starting in cold water? 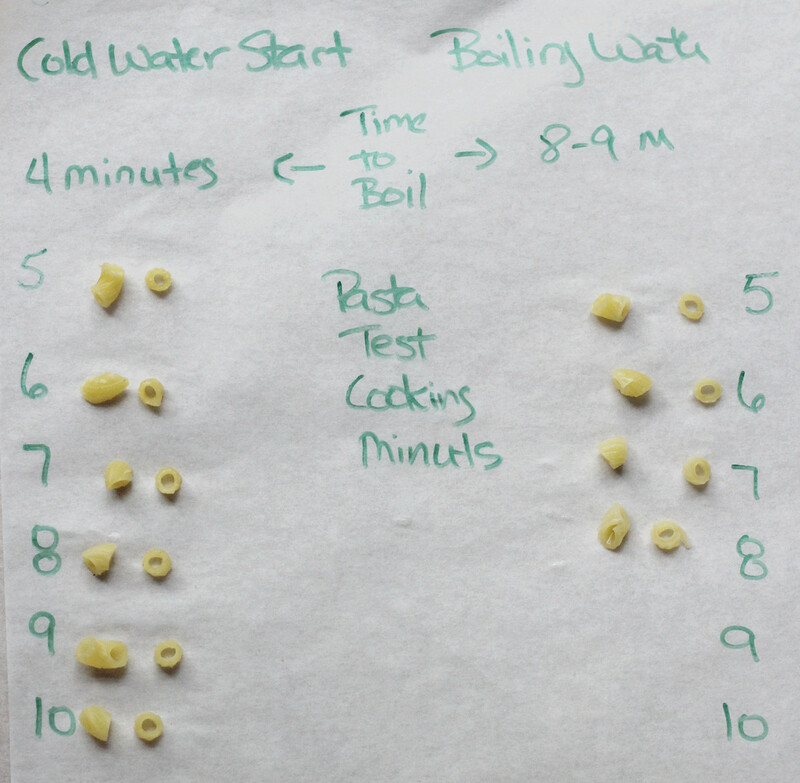 Should you start cooking pasta in cold water or boiling water? A side-by-side comparison. Keep reading; this photo will make sense. One thing that you might not know about me is that I tend to be a skeptic. In a good way. If someone tells me something that runs counter to what I believe, I love it. Because I might learn something new. But I don't simply believe what I hear. Mostly I disbelieve until I can find out more. If it's something that I can investigate on my own - like a new method of cooking - then I often perform my own experiments. That's how I fell in love with sous vide cooking. A number of people scoffed and said that it was nothing more than the old "boil-a-bag" method and completely useless. But that wasn't enough for me. I tried it, and I like it. I don't use it all the time, but there are results I can get from sous vide cooking that simply aren't possible any other way. Like 72-hour short ribs. And the rib roasts I've made using sous vide have been amazingly tender. When I can't do the experiments myself - like when we're talking about real science rather than kitchen science - I go online and hunt up reputable sites and dig as far back to original scientific papers as I can. I've read some pretty obscure research papers over the years. I love it when I learn something new, or when some bit of information changes my opinions. I also enjoy listening to, watching, or reading about things that I know are untrue. In those cases, I'm not looking for information to change my mind, but I'm honing my skills at seeing the flaws in logic or the fact-manipulation that's sometimes used to convince the less-skeptical. While I don't expect everyone to go to ground zero to get their facts, I do find it amusing when someone bases their decisions on "people say" or "everyone knows." I once asked one of these folks which "people" say these things. Do you know these people well? Have they studied nutrition? Do they have degrees in the subject? Where did you meet them? How many people have told you this? All I got was a tilted head and a puzzled look. I don't know if it sunk in or not, but I did suggest that other people would tell you the opposite, if you researched further than the backyard fence. This all came to mind because recently I mentioned that lately when I cook pasta, I start it in cold water. Someone responded that I must like mushy overcooked pasta and that I should ask "any good Italian" how pasta should be cooked. It was an odd comment, to say the least. First, I'm not sure what they meant by "good Italian." Is that someone who's nice to their mother? Someone who doesn't kick puppies? I suspect they meant that I should talk to someone's grandma who has been making pasta the same way for decades. A traditional Italian, perhaps. And as far as how I like pasta, it was interesting that someone would assume that the pasta was mushy or overcooked, or that I liked it that way. I was going to ask if they had ever tried the cold-water-start method themselves, but I'm pretty sure they would have said that they didn't because they don't have to. Everyone knows you start it in boiling water. Everyone. But here's the thing. When I first read about the cold-water-start method, I was skeptical. It challenged my long-held belief that you had to start pasta cooking in in a large amount of boiling water. I always started pasta in boiling water. Always. So of course, I ran into the kitchen and gave it a try. And now I always cook my pasta starting in cold water. Because it actually turns out better. The fact that it's done faster is a bonus. But, if I was you, I wouldn't believe me without a little more proof, so I went into the kitchen and did a side-by-side comparison of pasta cooked both ways. So, here's how it went. First, the cold-water start. I put 1/2 cup of elbow macaroni in a pot and added water about a inch over the level of the pasta. I added a little bit of salt, covered the pot, and put it on high heat to get it to boiling. The water came to a boil in 4 minutes - since there wasn't much water, it was pretty quick. I checked a piece of pasta every minute starting at 5 minutes. 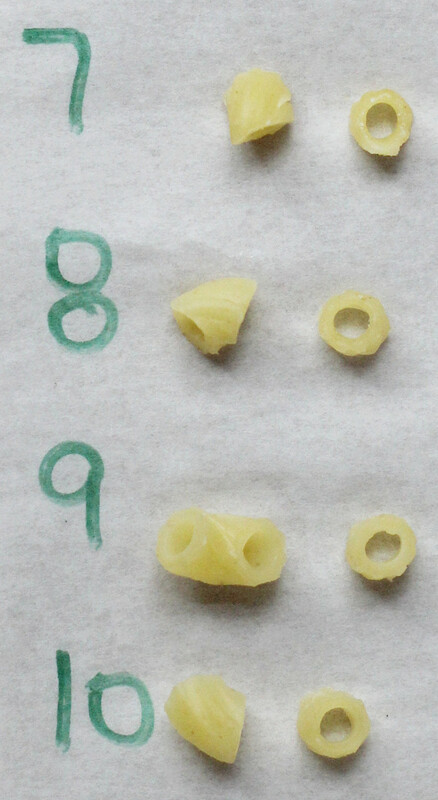 After 7 minutes, The pasta was firm, but you can still see a bit of white, dry, uncooked pasta. If I was going to add the pasta to a hot soup, or it was going into sauce and cooked for a few minutes, this would be a good time to get it out of the water. At 8 minutes, the pasta is cooked almost all the way through, but a really close inspection shows that it's still got a tiny bit that's not quite cooked. This would be a good time to take it out of the water if it was going into sauce for a short time. At 9 minutes, it was cooked all the way through. The pasta was plump, but still with a bit of chew. If I was going to toss it quickly with ingredients, but not cook it in a sauce, this would be perfect. At 10 minutes, it was a little softer, but in no way mushy. This would be the perfect cook for a cold pasta salad. So, this is 10 minutes total, since there was no time required to get the water to a boiling point. Keep in mind that I live at high altitude, so if you live at sea level, your cooking time is likely to be less. But what about starting the pasta in boiling water? How does that compare? I filled a pot about halfway full, added salt, and put the lid on to encourage it to come to a boil. That took about 8 1/2 minutes. I measured 1/2 cup of pasta and added it to the water, and started timing the cooking from that point - 9 minutes. I started checking the pasta starting after 5 minutes of cooking. The first thing I noticed was that the surface of the pasta was sort of ... slick. Or maybe the right word is pasty. The outer layer was cooking much faster than when I started it in cold water. The pasta was cooked through and plump at 7 minutes - about the same stage as the cold-water version at 9 minutes, but the outside of the pasta was definitely softer and a little mushy. Keep in mind that this is 7 minutes of cooking time, plus 9 minutes to get the water boiling, so it's 16 minutes total. I let it cook one more minute, and it was overcooked and had almost no "bounce" left. When I tried to cut it to see the interior, it broke. So there we go. The cold-water version cooked faster and more evenly. I thought for a moment that the outer softness of traditionally-cooked pasta might help sauces to stick, but I've been using the cold water method for a while and I've never had a problem getting sauces to hang onto the pasta. I suspect - but can't confirm - that the difference between the two methods might be a little more dramatic up here at high altitude. But I'm not the only one who says this works - even Alton Brown has written about it. But there's one point where I disagree with Alton. He says the cold-water method isn't useful for long pasta, like spaghetti. But I've cooked long pasta starting in cold water. The trick is to use a pot that's wide enough so the pasta can lay flat in the pot. It's a 5 1/2 quart braiser that's 12 inches in diameter, so pretty much any long pasta fits. Any pot that's wide enough should work, It doesn't need to be super-deep, because you only need the water a little bit above the pasta. If you're happy with the way you cook your pasta, I'm not saying you absolutely need to change what you do. I cooked mine using the traditional method for many, many years and never thought I needed to try anything else. But if you want to challenge one of your food assumptions, give it a try. Pasta is cheap, so you're not losing much if you don't like the result. And you'll save a few minutes of cooking time. I have an ice cream maker, so I usually use that to churn ice cream, and that's the sort of recipes that I tend to post here. But I realize that not everyone has an ice cream maker. And not everyone makes ice cream often enough to want an ice cream maker. But maybe they want to make ice cream once in a while. This recipe is amazingly easy, and I think most folks who taste it would be surprised to learn that it was made without an ice cream maker. It's light and fluffy and really really good. It's got more air whipped into it than the ice creams I make in my ice cream maker. If this was churned normally, I'd end up with about a quart of ice cream. This made about 1 1/2 quarts (six cups) of finished ice cream. The Deep Eddy Sweet Tea Vodka adds subtle flavor to the ice cream. No one will jump up and down and insist that it tastes like a cup of tea, or like vodka. They'll know there's "something" there that makes this more than just sweet, though. Vodka adds another benefit to ice cream, though. You know how ice cream can turn rock-solid in the freezer? This little bit of vodka changes the freezing point of the mixture just enough so that it doesn't freeze quite that solid. It's not soft, but it won't take a jackhammer to scoop the ice cream. Combine the condensed milk, salt, and vodka in a large measuring cup (for easy pouring). Stir to combine and make sure the salt is dissolved. Set aside. In a large bowl or in the bowl of your stand mixer fitted with the whip attachment, beat the cream until it reaches stiff peaks. Don't overbeat. While continuing to beat at very low speed, pour in the condensed milk mixture. Continue beating just long enough to make sure it's all combined. You can finish mixing it in by hand, if you like. The point is to mix it in thoroughly without deflating the air bubbles in the cream. Transfer the mixture to a storage container and freeze until firm. I received the Deep Eddy Sweet Tea vodka as a sample, at no cost to me. 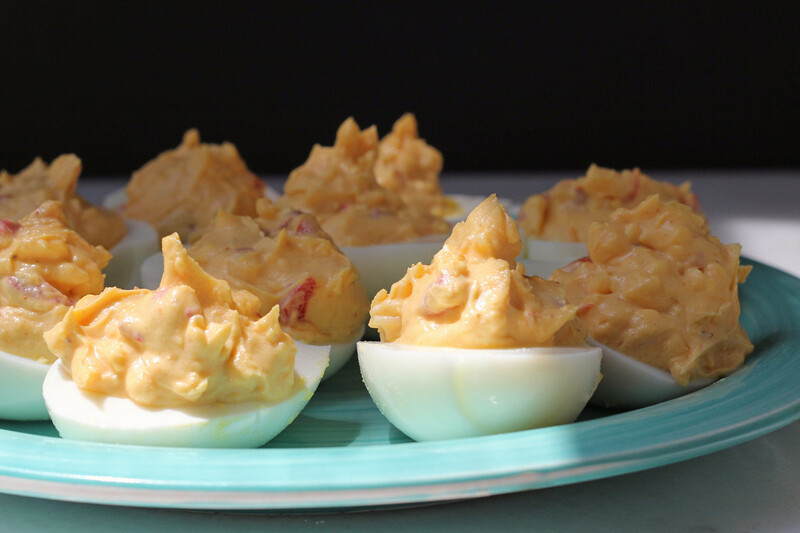 I love deviled eggs, so when I saw the pimento cheese stuffed deviled eggs in Pimento Cheese The Cookbook by Perre Coleman Magness, I knew that was one recipe I had to try. I also made pimento cheese. There are a whole bunch of different types of pimento cheese. Who knew? One thing I really like about this book is that the recipes that use pimento cheese don't have you start with one of the pimento cheese recipes. They're all self-contained, rather that recipes that require other recipes. And that means you won't have to make a tub of pimento cheese in order to use a portion of it in a recipe. 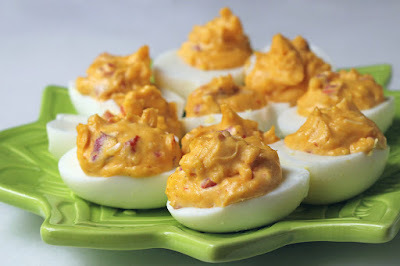 Not that I couldn't find a use for pimento cheese. 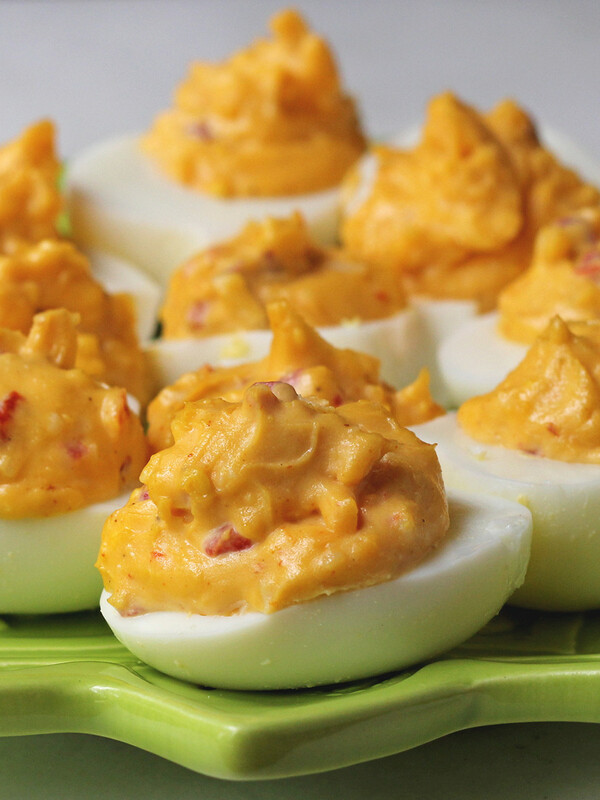 I've made an awful lot of deviled eggs in my life, and I tend to stick to variations of my "usual" recipe, unless I'm making something from a book. I don't think I've ever used cheese in the filling. I have used pimento as a garnish, but never in the filling. I think I'll be using both again soon. Cut the eggs in half lengthwise and remove the yolks. Place the yolks in a medium bowl and set the whites aside. Mash the egg yolks with a fork, then add the cheese (you can save a little for garnish, if you like), mayonnaise, paprika, and garlic powder. Add salt and pepper, to taste. Eggs, before refrigeration. The yolks are lighter in color. Mix and mash the yolk mixture until it's well blended and smooth. Taste for seasoning and add more salt, if desired. Mix in the pimento, stirring until the pimentos are evenly distributed in the yolks. Fill the whites with the yolk mixture. The book suggests that you refrigerate the eggs for at least an hour. I don't know if it's absolutely necessary. The yolk mixture firmed up a little bit during refrigeration, but I thought it was fine right after it was made. The one big difference I noticed was that the yolk mixture got a little darker after the eggs were refrigerated. Garnish with paprika and reserved cheese, if desired. My dad wasn't much of a drinker. He drank coffee in the morning, and water during the day. But I could imagine him enjoying an Arnold Palmer - a combination of tea and lemon juice - at a party or barbecue. He was also very interested in science, so I think he would have been amused by a blue tea that would turn colors with the addition of lemon juice. 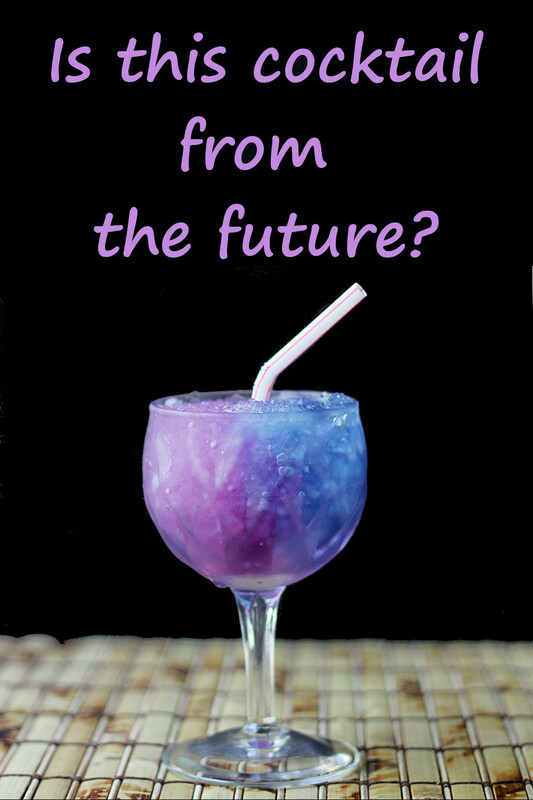 It's a futuristic cocktail that certainly didn't exist during Dad's lifetime, but I think he'd approve. Pink might not be considered a "manly" color these days, but think about it - the pink(ish) and blue sides of the glass could certainly represent boy and girl children of those dads. 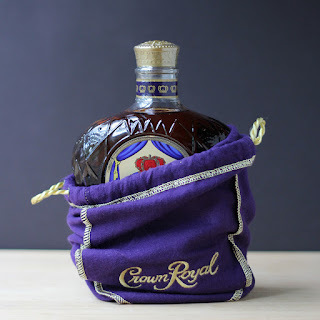 For dads who do drink (and for me, too) I've turned this into a cocktail with Crown Royal, which adds nice depth of flavor. Butterfly pea flower tea might be a little hard to find locally, but it's available online. I got mine from Wild Hibiscus Flower Company. It's pretty without pink; and the color is natural! Fill two glasses with the crushed ice. Combine the pea flower tea, simple syrup, and crown royal. Stir to combine. Pour the tea mixture over the ice. Add a teaspoon of lemon juice to the glasses, at the edge of the glass. Stir the juice in on one side of the glass only, to turn half of it pink-purple while leaving the other side blue. Because of the crushed ice, the color doesn't travel quickly throughout the glass, but for best presentation, serve right away. The color you get is dependent on how strong the tea is and how much acid you add - you can get anything from pink to purple, so it's a good idea to practice a bit if you're hoping to get an exact shade of pink or purple. Or, if you're into the show, add the lemon juice in front of your guests, and let them marvel at the color change as it happens. I regularly receive products from the Diageo brands of alcohol for my use.